Yitzchak Dumiel (right) with Guitian Li in 2008, a few days before their wedding. Yitzchak Dumiel (born Isaac Sterling, and he used Isaac as a familiar name until the end of his life) spent his childhood in Issaquah, Washington, in the same house where his parents still live. He attended Sunset Elementary School in Issaquah, and The Overlake School in Redmond, though he left Overlake after his junior year, and eventually graduated from the University of Washington without having graduated high school. He moved often in his life, though he spent the most time as an adult in Portland, Oregon; Seattle, Washington; and Shenzhen, China. Isaac was gifted from an early age, and tested with a genius IQ. His favorite activities were acting, drawing and music. He was a skilled sketch artist as a child, and he attended the prestigious Karen Kramer Drama Program, a competitive-entry program founded by the wife of director Stanley Kramer, to train children with exceptional acting talent. Still a kid, Isaac would tell his family about comedy advice he received from “Dom” — meaning Dom DeLouise — and other celebrities with whom he was on a first-name basis. As a teen, Isaac’s artistic interests moved more toward music, especially sounds that were dark and angry. He played the bass guitar, and his favorite band moved from Black Sabbath, to the Dead Kennedys, to The Swans. He preferred “early Swans,” whose music was blacker, for example the song Coward, which encourages suicide attempts. Isaac did not feel as though he fit in with his family, and had thoughts of suicide himself at this point is his life, though as far as we know, he never engaged in physical self-harm. The main symptom he carried with him into young adulthood was a pattern of romantically pursuing women who were not emotionally healthy. This led to painful breakups, and turned him into a highly intellectual but emotionally closed-off man, until he moved to China years later, and met Guitian Li, the woman who would become his wife, and his emotional rock. As a young adult, Isaac moved to Germany for a year to study, then returned to the Pacific Northwest. Upon his return, he began a ten-year-stint of volunteering to help senior citizens and children with serious illnesses. He supported himself as an in-home care worker for patients with spinal cord injuries. Around the year 2000, Isaac started exploring Orthodox Judaism. He enrolled in an Orthodox yeshiva (school for rabbis) in New York City, but decided to leave after a semester. It was around this time that he changed his name — first unofficially, and later legally — to Yitzchak Dumiel. Yitzchak is a Hebrew version of “Isaac,” and “Dumiel” translates as “The Silence of God.” He chose the name because he believed there was power and profundity in silence; this choice later seemed like a premonition, because cancer eventually took his voice, and he was unable to speak for the last several months of his life. Also around 2000, Isaac — who at this point was using both names interchangeably — founded an experimental music organization that has turned into the Seattle Phonographers Union. Phonography, intended to suggest the “sound version” of photography, is also known as “field recording,” and is a longstanding tool in both music and in scientific studies. In brief, the goal of artistic phonography is to record interesting “found sounds,” much as a photographer might visually record a beautiful sunset. The musician then arranges the found sounds together as a cohesive whole, writing “songs” where the only instruments used are the natural environment itself. Because of his pioneering work in Pacific Northwest phonography, Isaac was an invited panelist at academic conferences during this time. To this day, one of the top three Google hits for “Phonography” is Isaac’s essay “What is Phonography?” An excerpt appears in the pullquote below. In the year 2004, Isaac graduated from the University of Washington, and was offered a fellowship to continue graduate studies in neuropsychology and bioacoustics. However, he turned this offer down, in order to move to China, in the hopes that with a complete change of scenery and environment, he could find the roots and the happiness that had evaded him for so long. From the day he moved to China, and for the rest of his life, he referred to himself as Yitzchak Dumiel, though he always answered to Isaac as well. Guitian had moved from a small farming village to the big city, at first to attend school, but later to work so her younger brother would have enough money to go to college. She had had to interrupt her own college plans, and wanted to learn English at the very least, so she enrolled in an English class at the training center. This wasn’t Isaac’s class, but one day, Becky’s teacher couldn’t attend and Isaac substituted for him. Isaac and Becky hit it off, and eventually decided to start dating. Guitian started to actively pursue Isaac. The training center where he worked was in between her place of work and her home. So she would get off work, wait for him at the training center, and the two of them would go to dinner together, then go home separately. However, Becky often waited up to four hours for Isaac to get off work, just so they could go to dinner together. This baffled Isaac, and he called it “stupid.” Guitian, however, was undeterred, and the two of them soon found themselves spending every waking moment together, and they moved in together only two months after their first real date. Their wedding day in 2008 was perhaps the happiest day of Isaac’s life. Yitzchak and Guitian in 2008, just before their wedding. From 2006 to 2008, Isaac, under the pen name “Du Yisa” (a Chinese “corruption” of Yitzchak Dumiel), authored the blog Fanfusuzi, whose byline was, “China in English: perception is an act of translation. We also use what we cannot understand.” Through this blog, Yitzhak published short stories, prose poems, photography, and translations of classical Chinese poetry. The blog became quite popular, especially among English-speaking expats in China, and artistically-minded Sinophiles in other countries. A text entry and a photographic entry appear below. Understanding is a collective enterprise. Whatever we touch must share something with us. As we recognize ourselves, we locate the connections among what we touch. Yu Boya moored his boat. Then he began to play. His string broke. He got off the boat, his location betrayed by this sign of an unwelcome guest. On the shore, there was another listener. Yu Boya discovered the man was a woodcutter. Again, he sat down to play. Under the trees, he began with the piece “high mountains and flowing waters”, to discover what the woodcutter understood. Many generations later, this piece was sent from the earth to move through the stars, still with the same purpose. Visions of beauty 7 – window dressing. Shenzhen, China. Winter, year of the dog. Photo by Yitzchak Dumiel. In November 2008, Isaac was diagnosed with squamous cell cancer of the tongue. This was a “freak accident” type of cancer, as Isaac had never smoked nor chewed tobacco, nor engaged in other such high-risk activities. The cancer moved rapidly, and much of his tongue needed to be removed. Isaac and Guitian moved to the US for his treatment. Eventually Isaac required a “tongue” made from his chest muscles, and his disease progressed to the point where he never spoke again, and communicated through writing and hand gestures for the last months of his life. From 2010 to 2012, the focus of Isaac’s life was to fight his disease and to be as good a husband as possible. All his life, he had studied literature, music, and international philosophy, especially Taoism, Confucianism, Sufism and Buddhism. Also, throughout his adult life, he studied and appreciated Chinese panting, Chinese poetry, Chinese instruments, calligraphy, and tea. His health slowly worsening from 2010 onward, Isaac continued to collect music from around the world, and he studied Ancient Greek philosophy, especially the Stoics. However, all of his artistic interests were on hold. His closest friend during this time was Alan Genatossio of Seattle, who provided both him and Guitian emotional support, and who assisted with his physical care. Guitian once described the development of their marriage like this. When they first met and were dating in China, they would go shopping, and she would sometimes say, “Oh honey, I like this thing,” and Isaac would respond, “Sounds good, go ahead and buy it.” Then she would be mad at him because he didn’t understand she wanted him to buy it for her. Later, though, when they were living in downtown Seattle and his illness was worsening, Isaac would sometimes spend all the energy he had for the day to walk to and from Whole Foods, to buy Guitian Blue Corn Chips with Sesame (her favorite flavor) — and she would get mad at him because he was using his energy for “trivial” things. Isaac‘s condition worsened significantly in the fall of 2012, and Guitian started living in hospital rooms with him, barely using their apartment at all. Eventually, there were no more treatment options, and Isaac moved into Evergreen Hospice in Kirkland, Wash., in December 2012. Becky moved in with him; later, so did his brother Aaron, when he came to visit and Isaac asked him to stay. 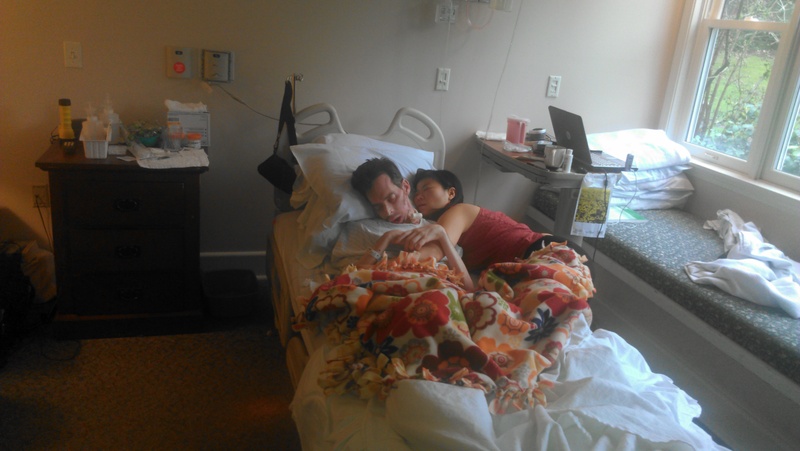 Yitzchak Dumiel and Guitian Li, Evergreen Hospice, December 2012. Photo by Aaron Sterling. The last three weeks of Isaac’s life were spent with Guitian and Aaron by his side. His parents visited daily, and many friends and colleagues paid their respects. One of the most touching gifts Isaac received during this time was from David Knott, an experimental musician he had known since the 1990s. Knott presented Isaac with an hour-long CD of field recordings of crashing waves of the Pacific Ocean. Isaac, no longer able to open his eyes, rolled his body toward David until he could touch David with his legs. It was one of the last times he interacted actively with another person. Isaac passed away in Evergreen Hospice on January 9, 2013, during the first snow of the new year; the night was crisp and beautiful. He died in the arms of Aaron and Guitian. He was buried in a nondenominational section of Sunset Hills Memorial Park in Bellevue, Washington. The funeral was arranged by the Jewish Burial Society, and held in an Orthodox manner, according to Isaac’s wishes. He left behind his parents, Michael and Alicia Sterling; his brothers, Aaron and Jacob “Jake” Sterling; his best friend Alan Genatossio; and his loving wife Guitian (Becky) Li. May his life and work live on in the minds of others. The peace and love among brothers and myself. Photo by Guitian Li. Evergreen Hospice, 7 Jan 2013. 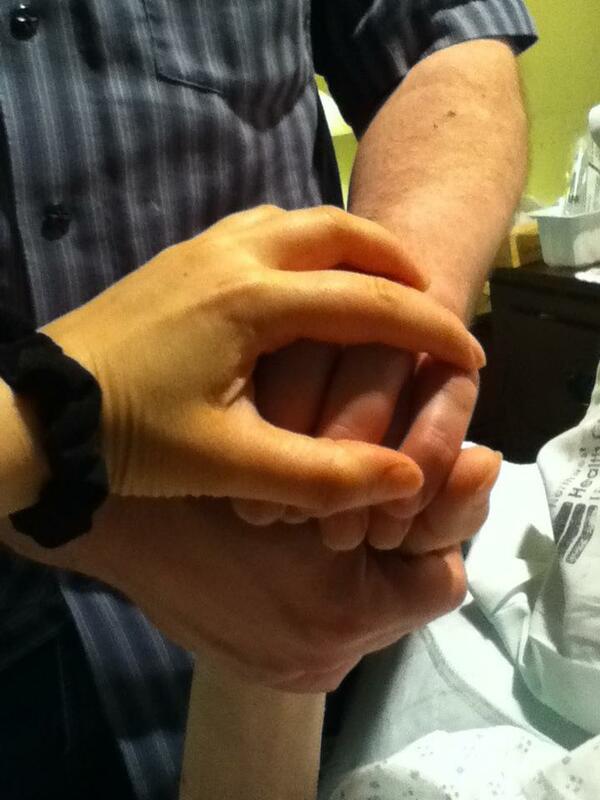 Hands of Aaron Sterling, Yitzchak Dumiel, and Guitian Li. Aaron, very nicely put together in Isaac’s memory. I enjoyed reading it and the memories evoked in the process. I’m glad I got to know your brother during the last few years of his life, it’s made my life much richer. Alan. Thank you for posting this lovely record of Isaac. I knew him well 20 years ago, while at Reed and in Portland. He was a close friend to me during that time of my life. I was wondering about him today, and found this. I am deeply saddened by his passing at a young age, but deeply happy to see he found much deserved joy in his later years. I am sorry for your loss and thank you for this beautiful retelling of his life. Thank you for providing this lovely biography. I’ve only now learned of his passing through the Reed College alumni magazine, and am glad to have some closure on Yitzchak’s life since last I saw him many years ago. He was a good friend and always had insightful conversation. We shared many smiles. I’m sorry for your loss. I am so sorry to have found Isaac too late. Wondered what had become of him throughout the years since high school and tried to track him down without success. Knew he would live an extraordinary life. Occasionally streetwise researcher of DNA self-assembly and other nonstandard applications of theoretical computer science.